When the Grim Reaper comes for you, as it shall for us all, do not forget to thank the angel of death for permitting you to live at a time in human history that coincided with Meryl Streep. Priceless treasure Meryl will be receiving the Cecil B. DeMille Award at this year’s Golden Globes, and while nobody actually believes the Golden Globes are a real awards show, she’s in marvelous company. Past recipients include Judy Garland, Joan Crawford, Lauren Bacall, Elizabeth Taylor, Audrey Hepburn and Sophia Loren. These are not so much people as they are phenomena, feared and loved and studied, not to mention bestowed the sort of immortality that accompanies endless human fascination. So why, you may ask, do we love Meryl Streep as we do? Here, now, feast your eyes on some of her greatest appearances so that you will never ask such a ludicrous question again. Here she is in August Osage County, delivering the performance that Faye Dunaway probably thought she was delivering in Mommy Dearest. In Heartburn, she manages to stammer her way through some stunning honesty. All worth it for what she does at the end there, a delicious punchline that is completely ruined by the thumbnail some intern picked for the video clip. It’s hard to choose a best moment from Death Becomes Her—”Now a warning? !” may be the greatest three-word delivery in cinema history—but this musical thrill at the opening ain’t bad. Apologies for the weird montage moment littered inexplicably throughout this clip. Her first appearance in The Devil Wears Prada is one of the most legendary entrances in cinema, and all she does is walk. Check out the full-body giggle at 2:20 in Adaptation, a movie that none of us will ever understand. Of course, Postcards from the Edge is required viewing right now. 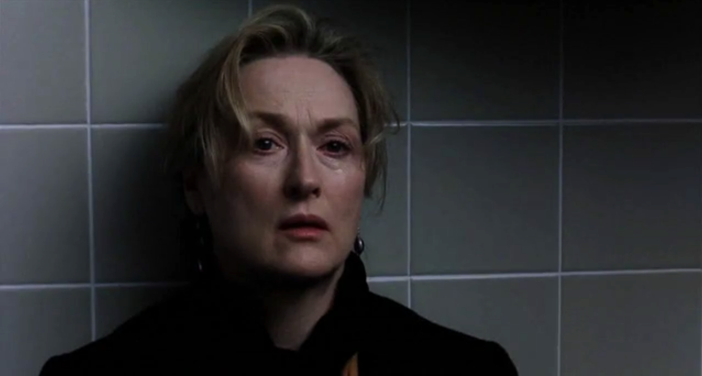 How does one choose a favorite Meryl performance? One cannot. It is an impossible choice. A Sophie’s Choice. You know, the thing she invented. Would you like to see Meryl’s lesbian kiss? Don’t be silly, of course you would. Here she is with Allison Janney in The Hours, and also in your dreams. I particularly love her disappearance into bubbles at 1:15 in She-Devil. And I’m particularly fond of her performance at the Oscars, when she draws applause simply by not moving. In 2004, Meryl accepted a Golden Globe—whatever that is—for her appearance in Angels in America wearing an unexpectedly transparent dress. She handled it like a champ. Her acceptance for the Emmy for that same role is glorious. Here she is in Angels. DEVASTATED. Congrats, Meryl Streep, on your well-deserved Cecil B. DeMille Lifetime Achievement Award! The Golden Globes air Sunday, Jan. 8, on NBC.